Haleʻiwa is a North Shore community and census-designated place (CDP) in the Waialua District of the island of Oʻahu, City and County of Honolulu. 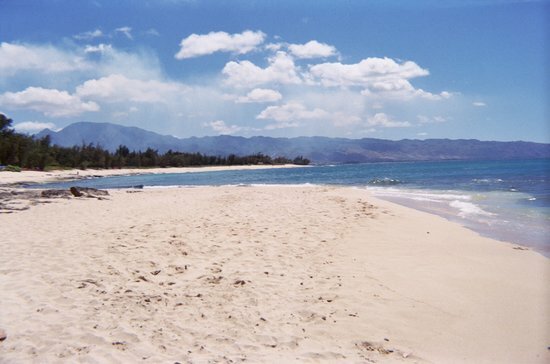 Haleʻiwa is located on Waialua Bay, the mouth of Anahulu Stream (also known as Anahulu River). A small boat harbor is located here, and the shore of the bay is surrounded by Haleʻiwa Beach Park (north side) and Haleʻiwa Aliʻi Beach Park (south side). Further west from the center of town is Kaiaka State Recreation Area on Kiaka Point beside Kaiaka Bay. As of the 2010 census, the CDP had a population of 3,970. It is the largest commercial center on the North Shore of the island. Its old plantation town character is preserved in many of the buildings, making this a popular destination for tourists and residents alike, visiting surfing and diving sites along the north shore. Waialua is a census-designated place and North Shore community in the Waialua District on the island of Oʻahu, City & County of Honolulu, Hawaii, United States. As of the 2010 Census, the CDP had a population of 3,860.